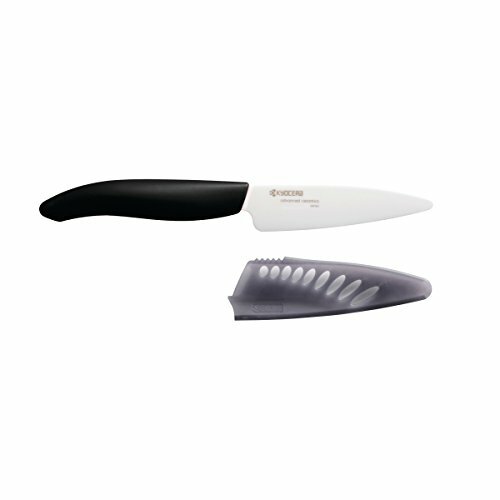 Kyocera’s revolution series fruit knife and sheath is an easy to travel with food prep knife. The blade, made from a proprietary zirconia material, is ultra-sharp, holds its edge up to 10X longer than steel knives, is lightweight, balanced, and won't Brown foods. Great for slicing fruits, vegetables, boneless meats and fish. Not to be used on hard foods or cheese. The knife is very easy to clean and will never rust making it perfect for outdoor activities, including camping, tailgating and picnics. Kyocera advanced ceramic cutlery and kitchen tool products are fully warranted to be free of defects in material and craftsmanship. 3.7" ceramic blade is made from Kyocera proprietary zirconia material produced in Japan for exceptional quality and beauty. Ultra-sharp, pure advanced ceramic blade will maintain an edge up to 10x Longer than steel blades. Ergonomic soft-textured handle for a comfortable grip. Lightweight and easy to clean, the blade will not brown food, is rust-proof and resistant to acids.